I started this week Diva challenge: Mickey Challenge #95, celebrating Disney's 1928 release of "Steamboat Willy" by guest blogger, Courtney Frantz. I watched the clip and decided that I would begin with a string of Mousekateer ears. Then a funny thing happened. I wanted to watch something light while tangling and decided to watch "The Secret of Kells" on netflix. I knew that it was going to have a lot of celtic artwork in it so how perfect would that be? So my tile ended up being Disney with a bit of Kells. Both were animated, but wow, the patterns in the Secret of Kells were wonderful! My tile? Well, you can judge for yourself. It's pretty mixed up. Perhaps I'll have time to create something again later in the week. 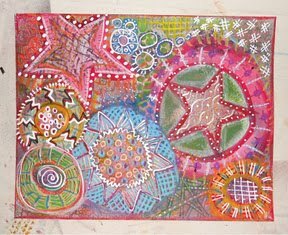 Some of the patterns I used: IndyRella, Joy, Mickey, HypKnotix, and some Kells inspired art. I think you made a very beatiful, balanced tile! You really can feel the movement in your tile! Nice work Janee, love how your tile is paddling along. It does Mickey proud. Very festive and lively. Fun way to use indyrella.